We've said it before, and we'll say it again: Online shopping is always a productive yet enjoyable way to banish boredom. In our experience, the best types of fashion items to shop for when you're bored are affordable ones and/or investment-worthy ones that you'll wear again and again. After all, no one wants to accidentally blow their clothing budget in one sitting on impulse buys just because they had some time to kill. With this in mind, we curated a lengthy list of items to shop that are quite reasonably priced. They're all basic wardrobe essentials that are also special—because special basics are the best basics, in our opinion. Even if you're not bored at the moment, take our word for it and keep scrolling to shop our finds. We promise you won't regret taking the time for a little wardrobe improvement. This feels a tad more polished than your typical denim jacket. These are giving us pocket envy (which is a thing thanks to Staud). Feels like your favorite white tee, looks a lot trendier. Yours truly just bought these new It sneakers. We can't resist a pretty slip skirt. Trust us: This will quickly become your new favorite bodysuit. Swap your boring gold hoops for these. We can't get over how subtly adorable this is. Boilersuits are happening. Join the party. Time for a new black swimsuit? Make it this one. Buy these Zara It shoes before everyone else does. An animal-print piece you can actually get away with wearing to the office. This brand makes the best sweatshirts, period. You can never have too many versatile croc-print bags. LBDs are far more interesting when they're covered with evil eyes, don't you think? We love everything about this, especially the color. Cargo pants are going to dominate this spring. Bring on the rainy days. The slightly boxy shape of this is so chic. Meet the modern-retro headband you've always wanted (whether you knew it or not). We'll take one in every perfect color. Give your necklace stack a little sparkle. You're likely to see this on some showgoers during fashion month. This will easily be the prettiest T-shirt in your collection. That piping you see is metallic, and we're into it. It would be a crime to cover these up with pants. It's no surprise that these cool leggings are selling out. We sigh with happiness every time we catch a glimpse of these. This popular line of white T-shirts got the stripe treatment. Everyone is wearing them, so you might as well too. Ankle slits make these even more wearable. Since this is made of 14-karat gold, you literally never have to take it off. The cute collar handily takes the guesswork out of layering. Everlane makes rain boots now, and they're pretty great, as you can see. A large portion of our editorial staff owns this perfect pullover. If you already have pencil skirts and pleated skirts, this one's for you. Spring is coming (eventually), and you'll want to wear these bike shorts when it does. All belts should have buckles this pretty. We'll never grow tired of this classic. 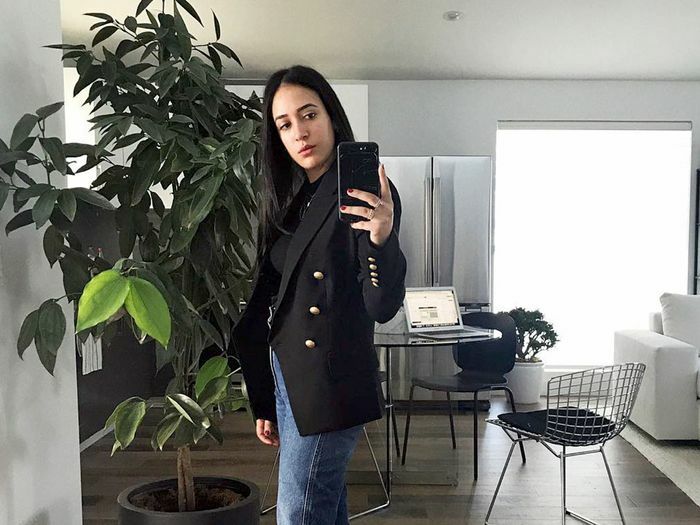 If you haven't tried Agolde's genius Pinch jeans yet, now is the time. These feel a lot less scruffy than your average Birkenstocks. Proof that sweats can look surprisingly polished. No one will think you stole this dad hat from your dad. Next up, shop the most French-girl items at Topshop.